For 2019 I decided I wanted to do Harley Quinn cosplays / crossplays again, but this time based more on the classic red and black style from the cartoons and comics. One of the bits I wanted was a custom, slightly over the top gun to suit her subtle personality! 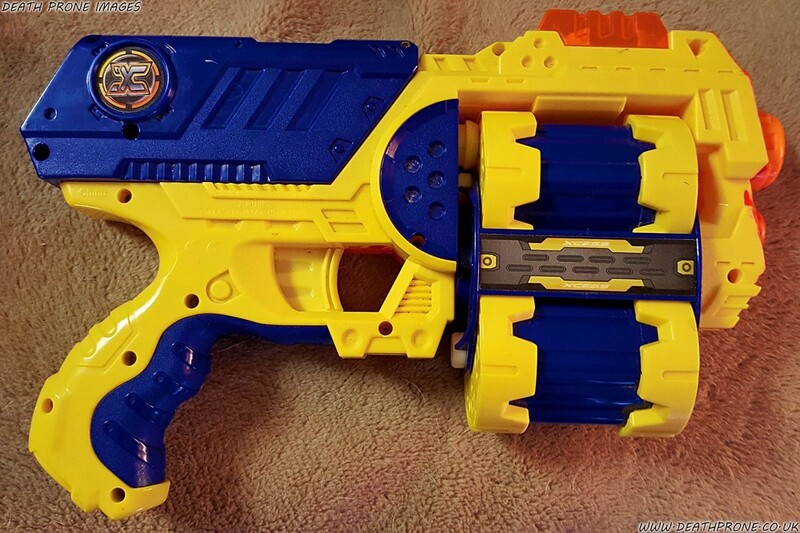 lol While at a local market I spotted a stall selling second hand toys and on it was this Nerf style gun, it’s not a real Nerf one, just one of the cheaper copy versions, but that didn’t matter for what I wanted it for. I only paid £2.50 for it. 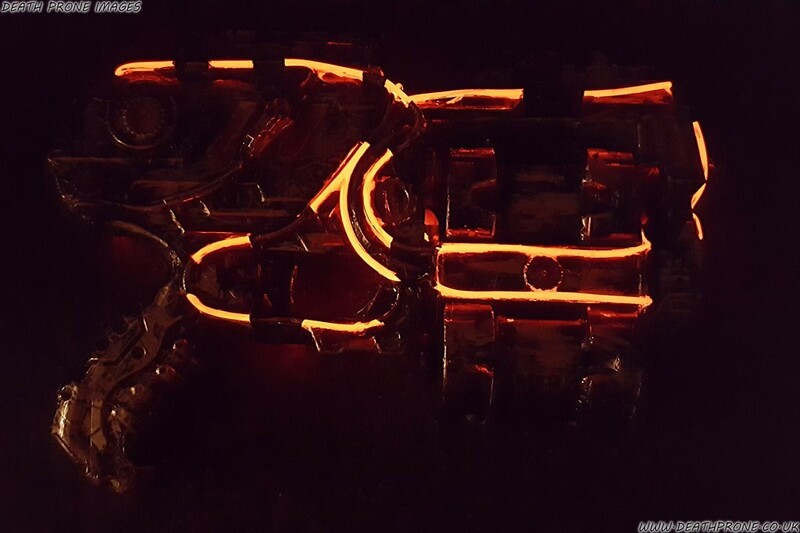 The other materials were a roll of aluminium foil tape for the metal look and a cheap 2xAA battery powered red EL cable (Electroluminescent). The total price was just under £6. 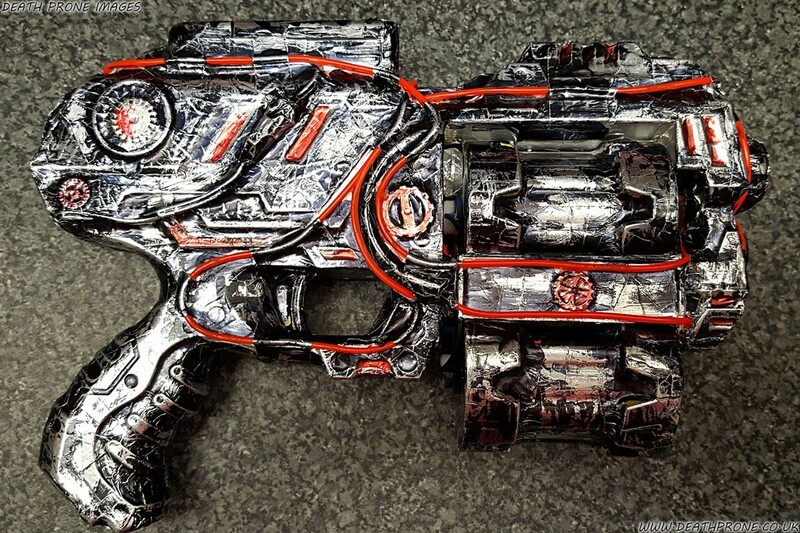 I started off by gluing the workings of the gun together to make it no longer work, that was a sad thing to have to do, but some cons (cosplay conventions) don’t allow working ones, plus I do have a couple of fully working proper Nerf guns anyway (I am 45, but have no intention of growing up! Lol). 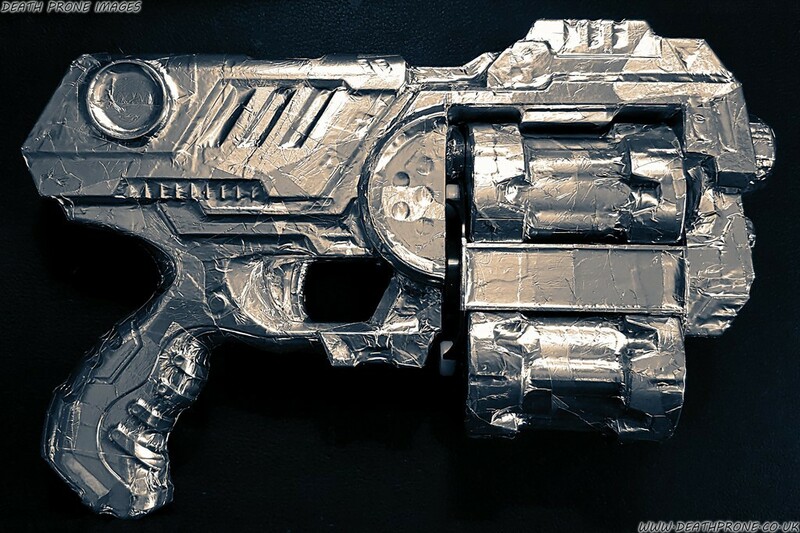 After that I covered the custom cosplay gun with aluminium foil tape, this made it look like it was made of metal instead of very brightly coloured plastic. Next was adding the three feet of red EL cable, I just wrapped it around the whole thing, holding it in place with yet more of the foil tape. The final (for now) stage was covering the entire thing with red and black permanent markers, that might sound a silly thing to do, but if you rub hard with a damp cloth it mostly comes back off! This makes it look very worn, aged and well used, the sort of look I wanted for it. I am considering adding a few more finishing touches to it one day, for now I am very happy with my custom Harley Quinn cosplay gun and look forward to getting out to cons with it. 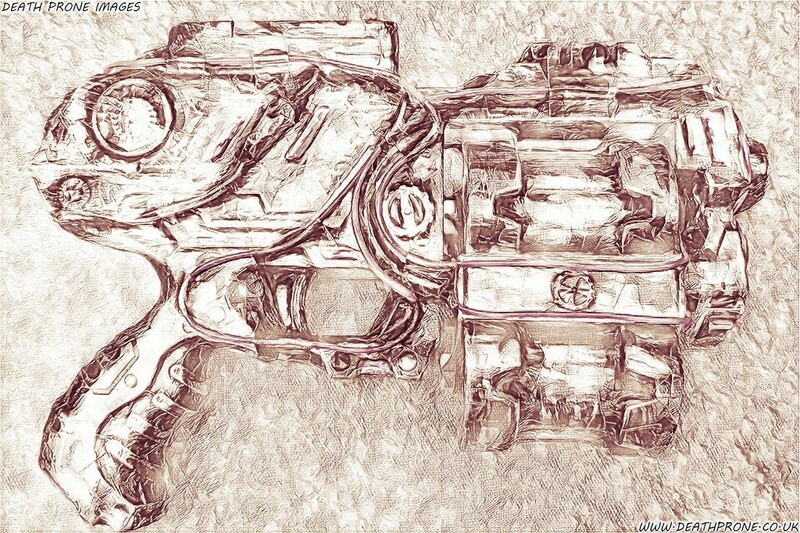 A little time and aluminium tape later and now my cosplay gun is starting to look better and much more metal now. A bit too shiny and new for my needs. Three feet of red EL light wires attached and ready to go. I want to look younger, but I wanted my cosplay gun to look old and well used, so lots of adding and removing of permanent markers. Stage three in the dark!